University volleyball team through an introductory clinic designed to teach the fundamentals of the exciting sport of volleyball. The rules, techniques, serving, passing and other various skills will be taught. 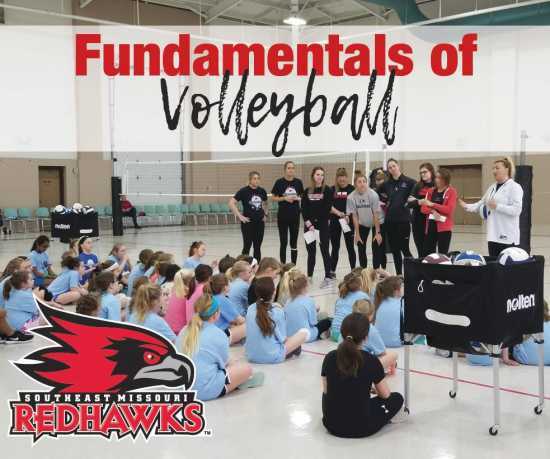 Co-sponsored by the Southeast Missouri State University Redhawks and the Cape Girardeau Parks & Recreation Department, this camp will be a great way to learn and have fun at the same time. The 7-10 year old camp will be from 12:30 p.m. - 2:00 p.m., and the 11-13 year old camp will be from 2:00 p.m. - 3:30 p.m.